Osborne: 'HS2 is engine for growth' Jump to media player Chancellor George Osborne has told the BBC that the the HS2 high-speed rail network will "create prosperity and jobs". 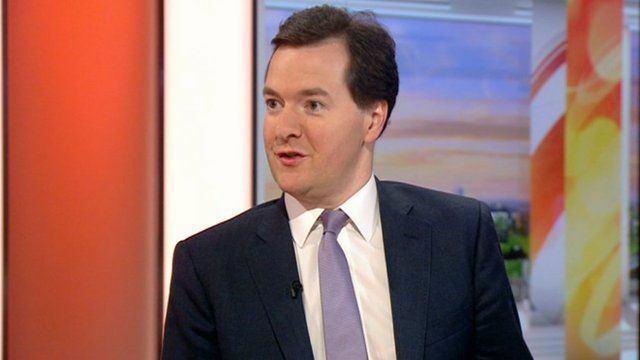 Chancellor George Osborne has told the BBC that the the HS2 high-speed rail network will "create prosperity and jobs". Plans for the rail network, which goes through Mr Osborne's own constituency in Cheshire, have received criticism and opponents argue that projections do not take into account competition from conventional rail. The preferred route of phase two of HS2, running northwards from Birmingham, will have five stops - at Manchester, Manchester Airport, Toton in the East Midlands, Sheffield, and Leeds. A final route for phase two is expected to be chosen by the end of 2014. Phase one of the £32bn line will link London and Birmingham.